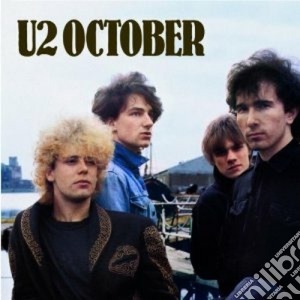 U2 - October: CD 1: 1. GLORIA 2. I FALL DOWN 3. I THREW A BRICK THROUGH A WINDOW 4. REJOICE 5. FIRE 6. TOMORROW 7. OCTOBER 8. WITH A SHOUT 9. STRANGER IN A STRANGE LAND 10. SCARLET 11. IS THAT ALL + LA VERSIONE STANDARD INCLUDE UN LIBRETTO DI 16 PAGINE A COLORI CON FOTO INEDITE, LIRICHE DEI BRANI E ANNOTAZIONI A CURA DI PAUL MORLEY (NOTO GIORNALISTA INGLESE DELLA STORICA RIVISTA MUSICALE "NEW MUSICAL EXPRESS" DAL 1977 AL 1983, NONCHÉ COMPAGNO DI VIAGGIO DELLA BAND IRLANDESE DURATE IL TOUR NORD-AMERICANO.